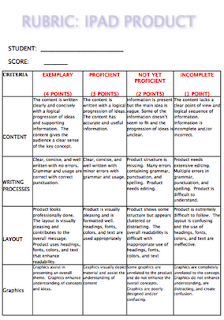 Today's post features a practical rubric to use in class to grade your students iPad projects. This rubric ,which I learned about through Techchef4u, is created by Lisa and Mrs. Greathouse to help them "ensure that students would not just do the bare minimum while rewarding those who went above and beyond". As you can see below, the rubric features 4 key criterion to base your grading on. These are content, writing process, layout, and graphics. Each of these criterion is assessed against a scale from 1 point (incomplete) to 4 points (exemplary). 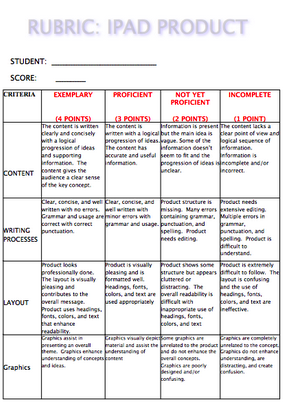 You might want to use this rubric to grade the projects your students do using iPad. It can also be a good model to help you design your own rubric that meets your own teaching needs. Check out the full graphic here.